← Lots of courgettes! Lots of fun! It’s been a while since I posted a recipe on the blog. I guess the blogging bug hits me intermediately, so I’m not very consistent with my posts, but I have been cooking SCD and developing lots of recipes. I have also been posting on another blog, about foraging. Back in the summer, during that courgette glut I talked about in my previous post, our neighbours gave us a HUGE courgette and I decided to tackle a recipe which will usually be a big no-no for SCD followers, Lasagne. The idea of replacing the lasagne leaves with courgette wasn’t that original. 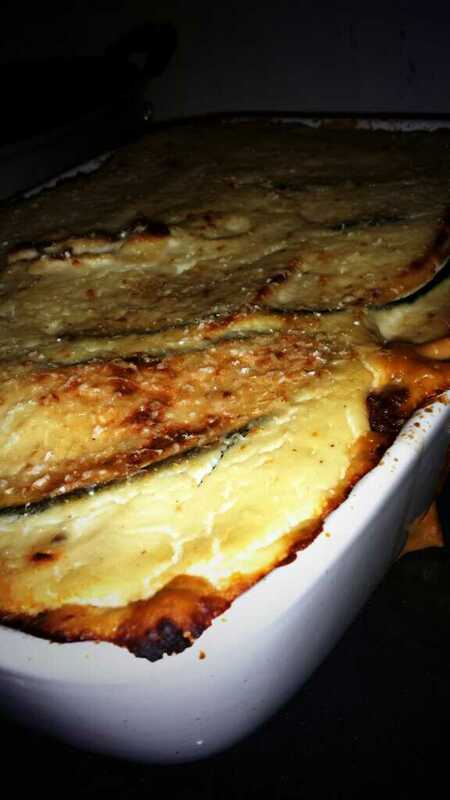 Moussaka is made with layers of meat and aubergine. The fun bit was coming up with a solution to replace the béchamel sauce. Luckily we have a Vitamix blender, so I figured, if you can make a creamy feeling soup with no cream in it, you can make a creamy béchamel sauce with no milk or flour in it. Cauliflower gives the colour and body and raw blanched almonds give the rich, smooth texture. The result is a mild flavoured, light and very similar to the original, vegan and SCD friendly béchamel sauce. Vegan friends, this is not a vegan recipe, but the béchamel sauce is purely vegan and can be used for any recipe that requires it. It keeps its texture and body well during cooking and tastes great. Like in making traditional regular lasagne, before they invented the no-cook noodles, there are three stages to the cooking process. It’s a bit of a project, but it’s totally worth it. Heat the oven to 190˚c, line a large baking tray or two with aluminium foil and brush with olive oil. Lay the sliced courgette strips on the oiled tray and brush with some more oil, which will help them brown. If you want, season with salt and any other herb you like, then roast in the oven for 15-20min, until browned. Remove from the oven and let cool. Meanwhile, in a large pan or pot, heat some oil and brown the chopped onion first, then add the minced garlic and cook for a minute more. Add the minced beef to the pan and cook until it’s browned, then add the canned tomatoes and the herbs. If it’s all to dry, add some water. Bring to the boil and simmer for 30-45min, mixing occasionally, until thick and cooked through, then season with salt and pepper to taste. Whilst the courgette is cooling and the meat sauce is simmering, make the béchamel sauce. Cut the cauliflower into large chunks and steam over boiling water (or in a steamer) until very soft. About 10min. Place the soft cauliflower and the rest of the béchamel ingredients into the blender and process, starting on low and slowly increasing to high speed, for about 3min, until you have a smooth, creamy sauce. Taste the flavour and seasoning and adjust to taste. Heat the oven to 170˚c and assemble the lasagne: In a deep, oven-proof dish ladle a small amount of your béchamel and spread it over the bottom of the pan. Place a layer of the courgette ‘pasts leaves’, then layer with a third of the meat sauce, then pour some of the béchamel. Place another layer of the courgette leaves, meat sauce and béchamel, until you have used it all up. If you can eat Parmesan cheese, grate a layer on the top and place the lasagne in the oven. Bake for 30-40min, until you see bubbling along the sides of the dish. Remove from the oven and let it rest for 10min so it sets and doesn’t fall apart when serving. Enjoy with a green salad and a glass of dry red wine if allowed.